Last week I went on a very long trip. I started off from home in Waco, Texas, flew to Boise, Idaho. I visited with family for 3 days and then, I hopped into the car with my aunt and drove half way across the country to Minneapolis, Minnesota. I saw many interesting things along the way, and one of which I want to discuss today. 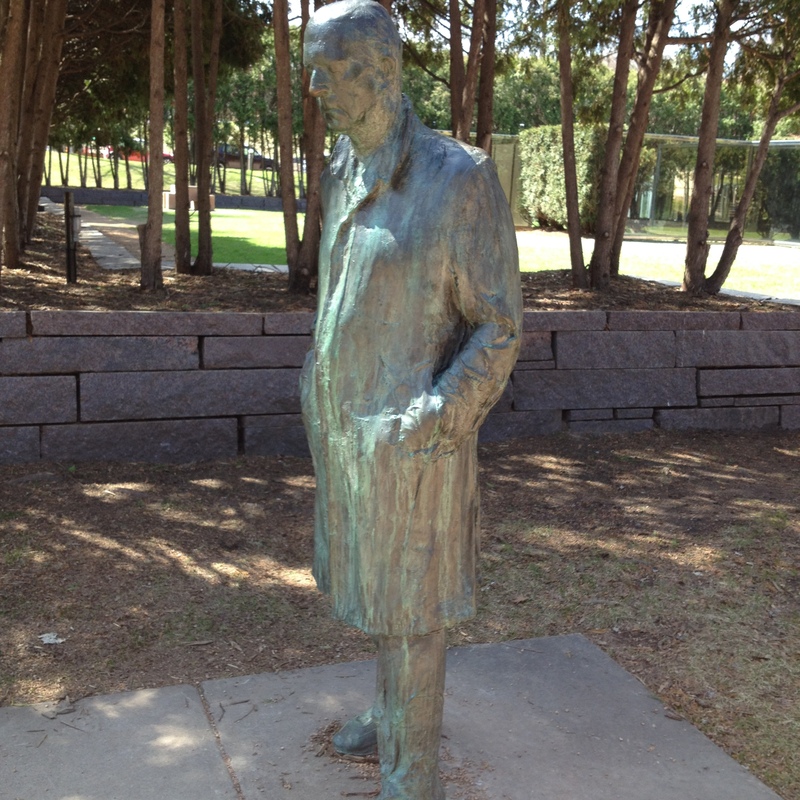 My aunt and her fiance took me to the Sculpture Garden in which I found this amazing statue. They had many wonderful and interesting works of art, but this one struck me. I would like to tell you why. When I first walked by this statue, I didn’t think much of it until I noticed something. It is a statue of a man walking. The details in it is what made me stop to really get a good look. His face was one of board-em, but he was in motion, however his eyes were closed and that is what made me stop to think. He looks as if he is walking to work, or possibly home from work, he is not happy or sad or angry, in fact there is no emotion at all really. In my head I saw him as walking a path he walks everyday, so much that there is no reason to open his eyes. How often does he walk this same path? He is not alive, he is just doing what he does. You might be wondering why I thought this was so interesting. To be honest, I wasn’t sure I wanted to take this trip. Over the last two years I have become very comfortable and safe living in my little home, going to Walmart once a week for grocery shopping and the occasional trip to school to drop kids off or pick them up when they missed their bus. I had a great deal of anxiety before my vacation. It meant I would leave the comfort of my home and husband, my kids and my dogs and doing something new, something even a bit dangerous. Flying ( I actually had 5 flights to catch in all) and a 3 day road trip. Anything could have happened, my flight could have crashed ( it has been 10 years since my last flight), I could get stuck somewhere like Denver, we could get into a car crash and die. The possibility seemed endless of all the things that could go wrong and the closer the trip the more frightened i became. I am very glad I did go ( glad to be home safe and sound however). I did something, saw things that I never dreamed I would see such as Mount Rushmore. I got to visit with my dad whom I have not seen in 3 years, and my grandparents and my aunts and uncle. For the last two years I HAVE been this man, doing the same thing over and over, day after day, not really living, just going threw the motions. I decided after looking at this beautiful statue, that I want to start living again. I want to see the colors in the world, I want to feel the sun and the wind on my skin again. I want to open my eyes as I walk along this road in life and start seeing the world around me. Thank you Walking Man for showing me that my eyes were closed and for giving me the courage to open them again.